Agganis received scholarship offers from no fewer than 75 colleges, including such programs of national renown as Notre Dame and the University of Tennessee. Fighting Irish head coach Frank Leahy had dubbed Harry “the finest prospect I’ve ever seen.” 11 Agganis, whose father, George, had died in 1946, surprised many football observers when he decided to attend Boston University to remain close to his widowed mother. Agganis later requested a dependency discharge to help support his mother, and returned to school in September 1951.19 He arrived home just two days before the Terriers’ football opener at William & Mary and got in an hour of practice before throwing a pair of touchdown passes.20 As a junior that fall, Harry threw for 14 touchdowns and a school record 1,402 yards, completing 104 of 185 passes, and earned the Bulger Lowe Award as the best collegiate football player in New England.21 In the spring of 1952, Agganis hit .322 for the Terriers in his return to the baseball diamond.22 Twice appearing on the cover of the prestigious Sport magazine, in the spring of 1952, Agganis was selected with the 12th overall pick in the first round of the National Football League draft by Paul Brown, coach of the Cleveland Browns, who wanted Agganis to succeed legendary quarterback Otto Graham.23 Instead, Agganis chose to return to Boston University for his senior season. If Agganis’s decision seemed rushed, there was a good reason: His signing came one week before the major leagues’ “Bonus Baby” rule went into effect, which required any players signed with a bonus larger than $4,000 to remain with the major-league club for two full seasons. Because he beat the deadline, Harry was able to get a higher bonus and still benefit from some minor-league seasoning. Meanwhile, Paul Brown was still trying to recruit Agganis for his Cleveland Browns. Billy Consolo, who roomed with Harry that spring, recalled Brown phoning every day in an attempt to persuade him to give up baseball, but without success. “I hope he can make the grade,” said Red Sox general manager Joe Cronin. “He’s colorful. He’s a good competitor. And being a local boy, he can be a great drawing card.” This was no trivial matter -- the Red Sox’ attendance had peaked in 1949 at nearly 1.6 million, but 1954 would mark their fifth consecutive decline, down to 930,000. The club organized a campaign to “Fill Fenway” for the home opener, getting support from the mayor’s office, but drew only 17,000 fans. Agganis had seen bigger crowds in high school and college than he saw in the major leagues. After the 1954 season, Mike Higgins, Harry’s manager at Louisville, replaced Lou Boudreau at the Red Sox helm. The biggest position battle the next spring involved Agganis, who was now challenged at first base by rookie Norm Zauchin. 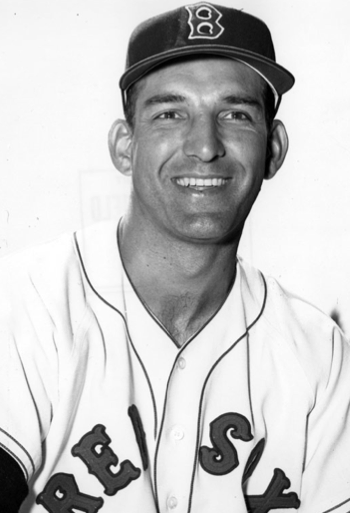 A big right-handed hitter, Zauchin had fared well for Higgins in Louisville in 1954, while Agganis had slumped in the second half of his rookie campaign. Zauchin outhit Agganis in spring training and earned the position to start the season. After Zauchin went hitless in the season’s first three games, Agganis started the next three. By May 4, Zauchin was hitting .189 and Agganis got the job. With Ted Williams temporarily “retired” (he returned in May after a divorce settlement), Agganis began hitting in Ted’s customary third slot in the batting order. Over the next month, Agganis hiked his batting average above .300. On May 15, in a home doubleheader against the Detroit Tigers, Agganis went 5-for-10 with two doubles and a triple, boosting his average to .307, tenth in the league.42 For the many local observers accustomed to Agganis’s extraordinary athletic achievements, he was on his expected path to greatness. Agganis rejoined the team on May 27 for a series with the Washington Senators, but did not play. He appeared weak and pale, his cough persisted, and he was perspiring heavily. Harry sat that day as Zauchin notched three home runs and 10 RBIs in a 16-0 rout, apparently reclaiming the starting job at first. Agganis finally got a start five games later in Chicago. The next day, June 2, against Virgil Trucks and the White Sox, Harry again made the start at first. With Williams back in the lineup, Agganis batted fourth behind his star teammate. Harry went 2-for-4, including a shot to the gap for a double. It appeared to be deep enough for a triple, but after reaching second base Agganis stopped and sat down atop the base, exhausted. Later, with two on and two out and the Sox behind 4-2, Harry hit a short fly to right fielder Jim Rivera, who made a circus catch, then doubled off Williams as first base to end the inning.44 It proved to be the final plate appearance of Harry Agganis’s life. He had hit .313 for his season with 10 doubles, a triple, and no home runs. Decades later, there were still people in the Boston area who would talk about the time they saw, or met, Harry Agganis, how much he meant to them, how much his loss was still felt. What he would have accomplished in his baseball career is not known. Nonetheless, in his 26 years he managed to affect the lives of tens of thousands, who will never forget him. Much of this biography was reworked from Mark Brown’s story on Agganis found at the Sons of Sam Horn wiki page. (http://sonsofsamhorn.net/wiki/index.php/Harry_Agganis). 1 Jean Hennelly Keith, “Harry Agganis – The Golden Greek,” Advancement (a publication of the Boston University Alumni office), Summer 2002. 2 Nick Tsiotis and Andy Dabilis. Harry Agganis, The Golden Greek: An All-American Story (Hellenic College Press, 1995). 6 George Sullivan, “Biography,” http://www.agganisfoundation.com/bio/bio.html. 11 Christopher L. Gasper, “Agganis Legend Lives,” Boston Globe, June 26, 2005. 12 Boston University Hall of Fame Web Site, www.goterriers.com/hallfame/agganis-harry.html. 14 Tsiotis and Dabilis, op. cit. 15 Boston University Hall of Fame website. 16 Tsiotis and Dabilis, op. cit. 17 Brian Berger, “Legend of Golden Greek lives on 50 years later,” MCB Camp Lejeune Press (Camp Lejeune, North Carolina), April 4, 2005. 21 Boston University Hall of Fame website. 27 Jack Craig, “Scully completes cycle at Fenway,” Boston Globe, July 9, 1989. 29 Boston University Hall of Fame website. 32 “Senior Bowl Star Gives Up Football For Diamond Sport,” The Free-Lance Star (Fredericksburg, Virginia), January 5, 1953: 5. 33 Boston University Hall of Fame website. 36 Harry Agganis player page and game logs at www.baseball-reference.com. 46 “Harry Agganis of Boston Red Sox Dies,” New York Times, June 28, 1955. 48 “Harry Agganis of Boston Red Sox Dies”. 50 Mark Armour, Joe Cronin: A Life in Baseball. University of Nebraska Press, 2010. 55 “Agganis Now Wed To God In Tradition Of Greeks,” Pittsburgh Post-Gazette, June 30, 1955, 20. 62 Ted Williams, My Turn At Bat, Fireside/Simon & Schuster, 1984, 15. 63 The National Baseball Hall of Fame and Museum. “Dressed To The Nines: A History of the Baseball Uniform – Parts of the Uniform,” exhibits.baseballhalloffame.org/dressed_to_the_nines/patches.htm. 71 Boston University Hall of Fame website. 73 “BU Yesterday,” B.U. Bridge, week of October 29, 2004 (Vol. VIII, No. 9), www.bu.edu/bridge/archive/2004/10-29/bu-yesterday.html. 74 “Lynn Sports History,” City of Lynn (Massachusetts) web site, www.ci.lynn.ma.us/aboutlynn_sports_history.shtml. 75 “Harry Agganis, The Golden Greek,” Agganis Arena web site, www.agganisarena.com/about/arena/harry.html. 76 “The Golden Greek in bronze,” B.U. Bridge, May 13, 2004 (Vol. VII, No. 30), www.bu.edu/bridge/archive/2004/05-13/agganis.html. 77 Saul Wisnia, “Shaping The Splendid Splinter, And Others,” Sports Illustrated, January 22, 1996, sportsillustrated.cnn.com/vault/article/magazine/MAG1007660/index.htm. 80 Jeremiah V. Murphy, “Harry … Only One Name Was Needed,” Boston Globe, June 27, 1980.